Super Hero Boy: Yum buttery goodness! I introduced Connor to butter for the first time this week. Ok maybe this was not exactly the best way to go about it but when I was little I absolutely loved butter. I still do, who am I even kidding, but as a kid I'd eat butter with a spoon if you let me. The only thing stopping me these days is the fact that I already need to loose some weight the last thing I need is to be caught with a spoon and a jar full of butter. Connor on the other hand could stand to gain a bunch of weight so I guess that's ok.
Ironically enough even though people seem to think eating your butter with some bread is somehow bad for you I'd like to change your mind on that. I'm notorious about missing breakfast or even worst eating something terrible for breakfast like a sugar coated pastry roll or something out of a box that honestly I'm not 100% sure what it is. I'd have to say that 99% of my weight problem has to do with the fact that I rarely ever cook a real meal these days and I'm so desperately hungry that I eat whatever happens to be within arm reach in the cabinet. Over the summer I'm bound and determined that I will stop that. The first stop on the road to snacking recovery is mission one.. eat breakfast. Who even said I had to cook to eat a fulfilling breakfast? Actually my favorite breakfast of all time is some scrambled eggs (I even know how to cook them in the microwave in less than a minute if you want to rush things!) and a slice of toast with a good wallup of butter. This is a joy I'm teaching Connor and I don't feel a bit guilty about it. Why? Because Country Crock has a new product out that makes me love butter even more! Country Crock s new butter spread with Vitamin D and Calcium has me wanting to go singing and dancing right into the grocery store. 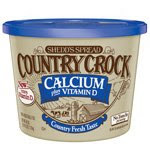 You can check out the label on the Country Crock website and if you look closely its only 50 calories per teaspoon and within that teaspoon your also getting 10% your daily calcium and a whopping 20% of your vitamin D for the day. That doesn't sound like much but I'd venture to guess that not unlike your children that most women are not consuming the recommended amount of calcium per day either! I would be the first to admit that I'm certainly not, not on my current diet. Compared to those sugary pastries and who knows what else I usually eat in the morning 50 calories with a piece of bread and some eggs is really quite tame. Not to mention that I feel way more satisfied after eating toast with butter than I ever do eating dry cereal or random nonsense. Feeling more satisfied means I snack less as well. The most important thing though is Connor is getting something good for him instead of overly processed unidentifiable foods. Thanks Mom Central and Country Crock for reminding me what breakfast is all about. If you guys would like to try the new Country Crock you can download a .55 cents off coupon on their website! While your over there do the Country Crock quiz for a chance to win a $25 gift card or a trip to Yellowstone!